Mid-size bougainvilleas like the gorgeous variegated 'Raspberry Ice' and the unique, tufted 'Pixie' make a strikingly beautiful landscape statement without becoming too huge to manage. If you want the amazing color and impact of larger varieties but are afraid the full-size plants will get out of hand and run rampant in your yard, you'll have no regrets choosing these mid-size "bougies." They also work very well in smaller landscapes. Like most bougainvillea shrubs (or vines, depending on how you grow the plant), these also have thorns. Avoid placing too near walkways where people must brush by them or in play areas for young children. Pixie is the least "dangerous" because the dense foliage covers the branches and hides the thorns. 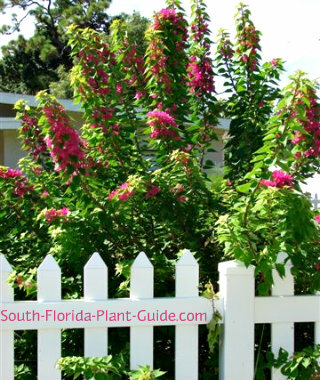 These impressive plants flower on and off year round and are one of the best winter flowering shrubs for vibrant color in South Florida. To get them to bloom more, cut back branches a good bit after each bloom cycle and apply a bloom-boosting fertilizer. Natural shaping of these shrubs is best, rather than being hedge-trimmed manicured. Unbelievably beautiful - one of the most glorious color combinations of all bougies, with bright red-pink blooms and white variegation on the leaves. 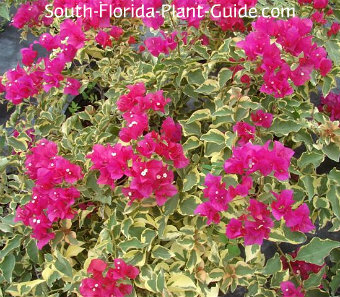 This is a moderate grower, not as fast as a typical bougainvillea because variegation slows the growth rate. Raspberry Ice bougainvllea can get fairly large but because it doesn't grow as rapidly as other varieties, it's easy to keep about 4 to 5 feet tall and 3 to 4 feet wide. Grow as a vine or bush. Downright cute with bright purplish-pink flower bracts, the most common Pixie has green foliage, but there is a pretty variegated variety with yellow and green leaves. This is more of a bush rather than a vine-like plant. It's dense and compact and grows upright rather than having the wide-spreading habit of most varieties. Pixie is also the easiest to handle - it grows in "tufts" with branches thickly covered in leaves and flowers covering the branch tips. Yes, it has thorns but you'll rarely notice them - the dense foliage of smaller leaves covers up the thorns making it more gardener-friendly than the typical bougie. Cut off long "arms" after each bloom cycle to keep it bushy. There is a miniature variety known as 'Pink Pixie' but this Pixie is no miniature. It can attain a large size if you let it but can be trimmed to 4 to 6 feet. 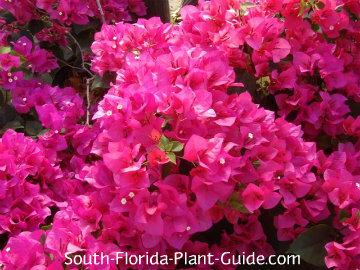 Bougainvillea needs a well-drained area to survive and a sunny area to thrive. These full-sun lovers are evergreen, moderately salt-tolerant, and grow at a moderate to fast pace depending on variety. They can be kept 4 to 6 feet tall. 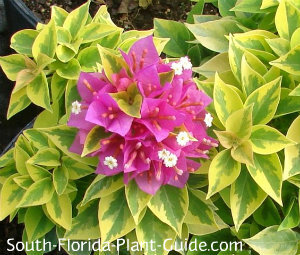 They're cold-hardy and do very well anywhere in South Florida, but avoid placing in windy areas where the colorful flower bracts can be blown away. Add top soil or organic peat humus to the hole when you plant. You can also mix in composted cow manure to enrich the soil around the plant's rootball. 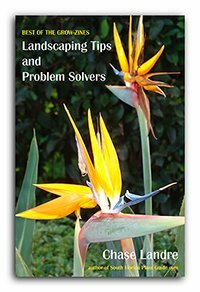 Drought-tolerant once established, these shrubs do best with a regular irrigation schedule that allows time for the plant to dry out between waterings. Trim after each bloom cycle, cutting each branch several inches or more below the flowering area. Fertilize at least once each season - spring, summer and fall - with a quality granular fertilizer. Supplement feedings with applications of bone meal and/or liquid fertilizer to get the most flowers most often. Place 3 feet apart. Come out from the house 3 feet. If planting by walks or drives, come in 4 or 5 feet. These shrubs work very well as container plants. Place pots where fallen petals won't make a mess. COMPANION PLANT SUGGESTIONS: Use other plants that like dry conditions, such as Drift rose, juniper, carissa, Green island ficus, and cycads like King Sago.